KK 2.1.5 released – wait what? 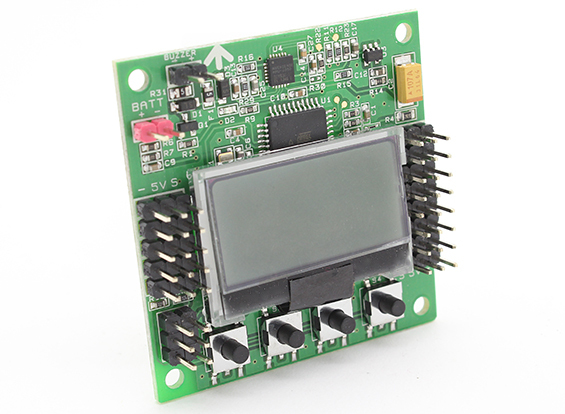 The KK 2.1.5 flight controller board has been released! Was that really worth a hardware upgrade? Are we going to get asymptotic hardware updates now? Is the KK 2.1.5.25 upon us next? In any case, the good news is that the price is still the same, USD $29.99 and it’s otherwise identical to the KK 2.1 flight controller we reviewed recently. The KK 2.1 is here! This incremental hardware update features new sensors and a beefier microcontroller, but does this improve performance? Read all about it in our review after the break! The Micro-X is a tiny MultiWii Quadcopter with a lightweight frame that has the flight controller integrated into it. You may be wondering why this is new given that they already have several versions of this available – well this model comes with two batteries, and the DSM2-Receiver is integrated on the PCB. It’s about USD $50.- which is a pretty good price. 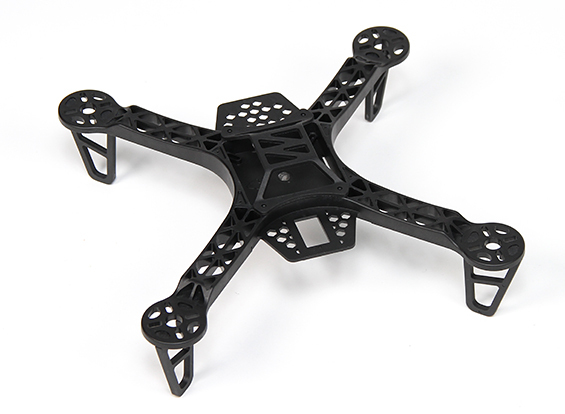 The FPV250 frame is a one-piece frame for mini-sized FPV quadcopters. You can fit any 50×50 standard flight controller like the Crius AIO or the KK 2.0/2.1 boards, and it has tabs and mounts for small fpv cameras and video transmitters. Being a one-piece frame means that while it’s very rigid and certainly repairable with epoxy, severe crashes mean you’ll have to buy a whole new frame. However, it’s $10 a piece so we can’t complain! The SK450 is a ready-to-fly quadcopter featuring a KK 2.0 flight controller, 20A ESCs, four 2213 motors and a full set of 8×4.5 as well as a set of 10×4.5 props. This is an interesting package because not only is the KK flight controller absolutely excellent (even more so with RC911’s amazing “++” firmware), but you get props for both heavier payload (battery, camera) as well as for aerobatic flying. Also included is a Turnigy 5x radio system, so this is really a complete RTF package. The KK 2.0 looks a bit strange, given that they’ve phased out this model in favor of the KK 2.1 recently, but from our tests you should not let that deter you as the 2.0 board flies just as well. If you already have a radio and/or you want a better radio, you should consider building our $120 Quadcopter instead. You can get a really nice computer radio for the $70 you save. That said, the idea is a good one and maybe HK will release a version without TX, or with a Turnigy 9x lateron. The new KK 2.1 arrived! This updated version sports an MPU6050 sensor, which should remove the rotation rate limitations of the KK 2.0 controller. A full review is coming, in the meantime check out the first look inside. HobbyKing just released their KK 2.1 flight controller. It’s a hardware upgrade from the already-great KK 2.0 and features the same tried and tested integrated display and buttons. What’s new then? Mainly an upgrade to the excellent MPU 6050 accelerometer/gyro sensor chip, as well as a big fat Atmel Atmega644PA for additional outputs and more program memory. 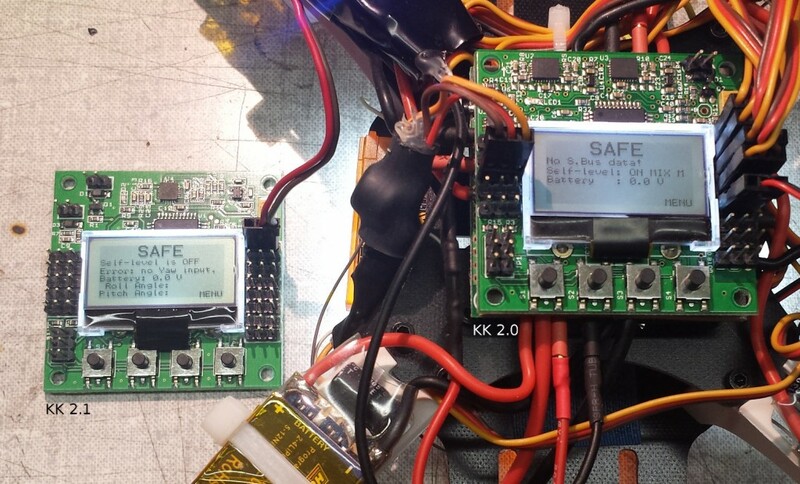 The KK 2.0 was already an excellent flight controller (see our review), and the little integrated LCD proved to not only be highly crash resistant, but incredibly useful in helping with setup – making this a lot easier and quicker than setting up a Naza actually. With this upgrade one of the minor negatives of the KK 2.0, the limited maximum rate of rotation sensing that can result in the flight controller becoming confused during extremely fast flips, is greatly improved. 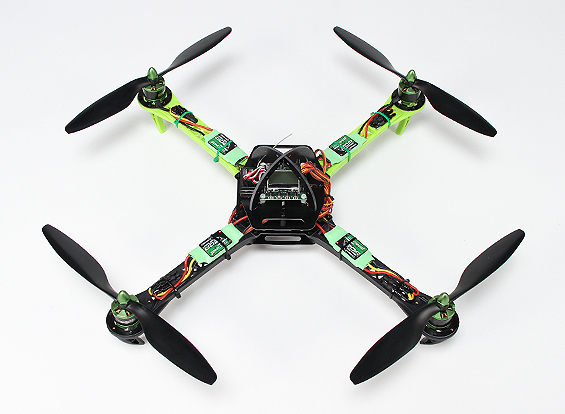 The KK2.1 can be yours for USD $30.- via Hobbyking. Specs and video after the break. LCD Screen! Accelerometers! It even glows in the dark! The new KK2 flight controller from Rolf Bakke sure has a lot going for it, but is it worth the noise that HK is making around this controller? Read on for an in-depth review!